Located in the Kurnool district of Andhra Pradesh, Srisailam is a well-known and immensely popular pilgrimage centre amongst Hindus. Therefore, it is frequented by people from all over the country. Even though Srisailam is mostly visited by pilgrims, it is also a weekend destination for several travellers and tourists on account of the presence of numerous beautiful sites within its boundaries. The surrounding region of Srisailam which is blessed with forests and hills is an ideal weekend stoppage for trekking and camping. Hence, it wouldn't be wrong to say that Srisailam in Andhra Pradesh is one place which can be savoured by each and every kind of tourist. As it is situated in the close proximity, it makes for an amazing and unforgettable getaway. Let's move ahead and read in detail about this pilgrimage town and how to reach it. Srisailam experiences a hot climate during the summer season. Hence, the best time to visit it is from October until the end of February as this is the period when you can explore its attractions comfortably in a pleasant environment. 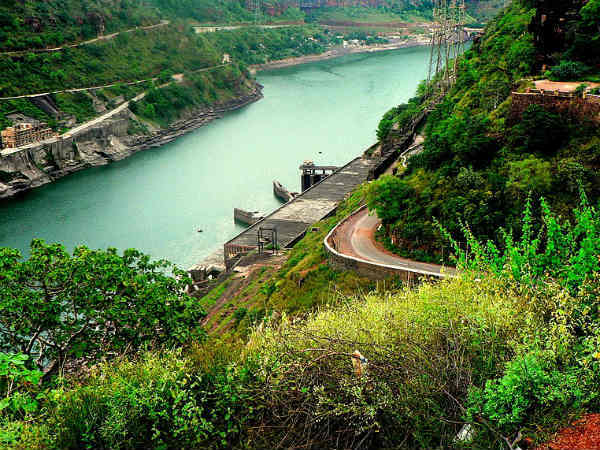 However, Srisailam is a year-round destination for Hindu devotees and offbeat travellers. By Air: As the nearest airport to Srisailam is located in Hyderabad, there is no option available of reaching Srisailam from Hyderabad by flight. By Rail: Srisailam doesn't have a railway station of its own. Hence, you need to catch a train to Cumbum railway station and then from there, you can hire a cab or take a bus to reach Srisailam. The distance between Cumbam and Srisailam is 102 km. By Road: Being a pilgrimage town, Srisailam is well connected to other cities, and hence can be reached by road. On your way, do not forget to take a break at Kadthal and explore its beautiful attractions. Kadthal is located at a distance of about 53 km from Hyderabad and 164 km from Srisailam and is a perfect place to take a break. Even though there are not many places to explore within its boundaries, it still deserves to be explored on account of the presence of several beautiful temples. The most prominent amongst them is Maisigandi Maisamma Temple. It is a popular attraction in the region of Kadthal and is visited by Hindu devotees from all over the district. You can also visit the beautiful Maheshwara Pyramid. Srisailam is located at a distance of about 213 km from Hyderabad and must be visited by every traveller and tourist who always looks forward to exploring the culture and natural beauty of Andhra Pradesh. Apart from temples, there is a lot to savour in and around Srisailam. Therefore, Srisailam must be added to your bucket list. Following is the list of the major places which you can enjoy while in and around Srisailam. How can a visit to Srisailam be deemed complete without visiting its most frequented and most popular site? Dedicated to Lord Shiva and Goddess Parvati, this beautiful temple is the only religious site in the world which is called both Jyotirlinga and Shakti Peetha. Therefore, it is no wonder it remains flooded with tourists and Hindu devotees during the festive season. As the reason in and around the temple harbours a peaceful environment, it is capable of soothing your mind, body and soul. So, what do you think about a visit to Mallikarjuna Jyotirlinga this weekend? If you are a nature lover or a landscape photographer, then Nallamala Hills on the outskirts of Srisailam is your calling. It is one place where you can go camping, trekking and hiking. You can also visit it for a refreshing weekend as the pleasant atmosphere of these beautiful hills will certainly charm you and pacify you to the core. Being a part of the Eastern Ghats, the region of Nallamala Hills is blessed with lush greenery. Are you a wildlife lover? If yes, then Nagarjunsagar-Srisailam Tiger Reserve is your stoppage in Srisailam. Established in the year 1983, it is the largest tiger reserve in the country and is spread over an area of about 3728 sq km. Apart from tiger, the major species which can be spotted here include Indian leopard, chinkara, sloth bear and sambar. You can also visit the majestic Nagarjunasagar Dam which is located in its region. Other places of interest in and around Srisailam include Akka Mahadeva Caves, Shikareshwara Temple, Srisailam Dam and Pathalaganga. So, don't you think a visit to Srisailam this weekend would be an unforgettable affair?